A family say they are lucky to be alive after a car mounted the pavement and crushed them against a wall. Janice Kent, her brother Geoff and his wife Lesley were walking in Henleaze, Bristol, in January when they were hit by a car, driven by a woman in her 80s. 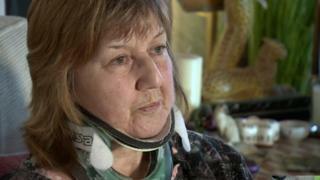 Ms Kent suffered numerous fractures but said despite "all this damage" the driver was "still carrying on". Police said they had spoken to the driver about giving up her licence but it was a matter for the DVLA. According to Avon and Somerset Police, the car was reversing near the Co-op on Cardigan Road when it mounted the pavement. Mr Kent said his wife was "thrown up in the air" while he and his sister were crushed between a clothing bin and the wall. "All I could feel and hear was a whoosh and it was just like a grey mist and that was it," he said. "I was then unconscious and found myself with my head against the wall and the vehicle right on top of my body." He suffered a fractured pelvis and ribs but said his wife had been "very, very traumatised". "She actually saw the vehicle coming at us and heard the screaming of the engine," he said. "I heard nothing, I saw nothing and I felt nothing but I do feel lucky to be alive." His sister, who suffered a double skull fracture, a broken neck and a punctured lung, said she was angry as she did not "understand how it could possibly have happened". "To be walking on a pavement, you don't expect that to happen," she said. "Yes I do feel lucky to be alive but she's done all this damage and she's still carrying on." A spokesman for the Driver and Vehicle Licensing Agency (DVLA), said all drivers had a legal responsibility to "meet the medical standards to drive". He added that drivers also had to tell the DVLA about "any relevant conditions" which could affect their driving.